Healthy eating. None of us like to think we’re unhealthy eaters. Yet how many times a year do you resolve to eat healthier? Admit it, you’ve probably made New Resolutions or started eating better to slim down for swim suit season. It’s easy to say we’re going to eat healthier. Doing it is another thing. Maybe it’s that chocolate craving you can’t (okay, be honest… don’t want to) kick. Or maybe it’s because choosing healthier foods can actually be more expensive. 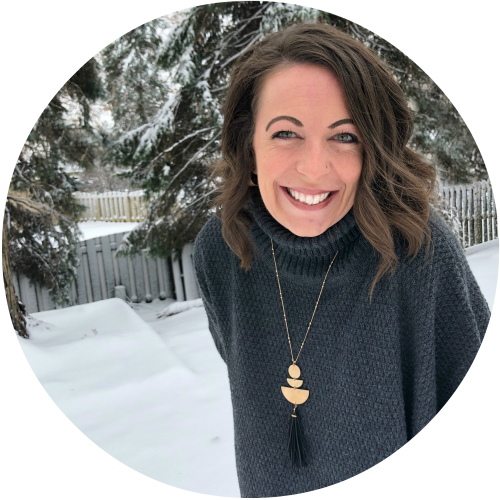 That’s why I’m so excited to have Pam Howard, a Certified Holistic Health Coach, of Be Healthy Be Happy Wellness guest posting today! 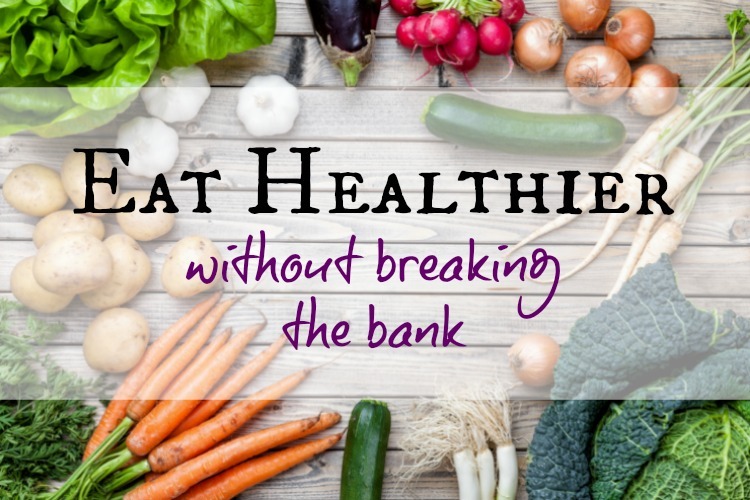 Pam is sharing 5 fabulous tips to share on how we can eat healthier without breaking the bank! 1. Check out your local farmer’s market. In the summer, this is an easy solution – by now, most cities and towns have farmer’s markets. Luckily there has been such a demand in recent years, that even here in the Midwest, we are starting to get winter farmer’s markets — yes, the selection is a bit more limited, but the produce is fresh, reasonably priced, and full of nutrients! In the summer, when the competition is fierce, a great way to get extra savings is to offer to buy a large quantity from a farmer. Often, you can get a lower price by buying in bulk. Then, split your purchase with a friend if you don’t need (or can’t use) it all before it goes bad. 2. Go straight to the source. Anyone who eats a whole foods diet knows that meat is typically the most expensive part of the meal! A great way to save on meat (and ensure the quality is what you want for your family), is to purchase directly from a local farmer. Many farmers will sell their meat in portions (1/4 or 1/2 a cow or pig is a great size for a family of four to six). If that’s still too much meat for your family, find some friends to go in on the meat purchase with you. We purchase our meat once a year from a local farmer who raises his livestock in an organic, grass-fed manner. Yes, that one-time-a-year bill is something to budget for, but we have plenty of delicious meat in the freezer and our monthly grocery bill tends to be quite low. This one is my favorite tip — not only will you be purchasing your produce at the lowest price, it’s more likely to be local, fresh, and taste better! For example, we tend to eat a lot of apples in the fall, asparagus in the spring and tomatoes in the summer. If you are interested in a wider variety of produce year-round, buy it when it’s in season and freeze or can extra for the rest of the year. We do this with blueberries, peaches, corn and apples. I never have to purchase a pint of blueberries for $4 in the winter. Instead, I can pull a bag from the freezer full of organic blueberries frozen the day after they were picked (and purchased for $2 a pound!). Let’s face it, a winter blueberry shipped all the way across the country just doesn’t taste as good as one picked in July! If you are following the previous tips, look at the weekly grocery ad to determine what produce is on sale and in season, and plan your weekly meals based upon those items along with a variety of the meat that’s already in your freezer. It’s easy to menu plan and your weekly grocery bill will stay low. Just make sure to create a grocery list and stick to what’s on that list – that way you don’t buy extra food that will just go to waste. I know it’s convenient, but don’t buy the individual packaged goodies. They cost a fortune! Instead, once a week, make up a batch of cookies, a tray of muffins, or a loaf of quick bread and then portion them out into individual servings. Your kids won’t complain about eating the same cookie and quick bread for a week if it’s delicious – just do a different one each week for variety. For snacks, think of easy, healthy and inexpensive things like air popped popcorn, cut up veggies and fruits with dip, or a small cheese and cracker plate. Remember that eating healthier is a choice. Plan your meals in advance, plan where you’re going to shop, and you’ll find yourself eating better and saving money at the same time! 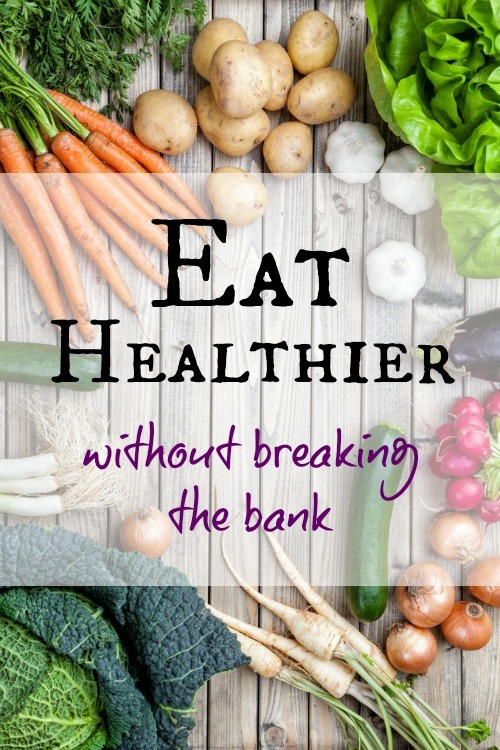 What is your best healthy eating budgeting tip? We’d love to hear it! Tell us in the comments below! Pam Howard is a Certified Holistic Health Coach who specializes in helping busy moms become healthier, so they can enjoy a happy, fulfilling life. She hold online classes which teach you how to shop healthy and affordably, how to help the whole family eat healthy, and how to make good eating decisions when you’re away from home! Find her at Be Healthy Be Happy Wellness. These look delicious! i will have to try your recipe soon. My kids will love these so much. I will try the best. Now I can change my menu regularly for my family, esp. for my kids. Thank you. Thanks for sharing all of these wonderful ideas on healthier eating. I just love the idea of “going to the source”. Thanks for sharing my tips and program with your readers. It’s going to be a lot of fun and you’ll learn a ton of my tips for getting your family to eat well too (without all the stress and hours of cooking!). Happy New Year!